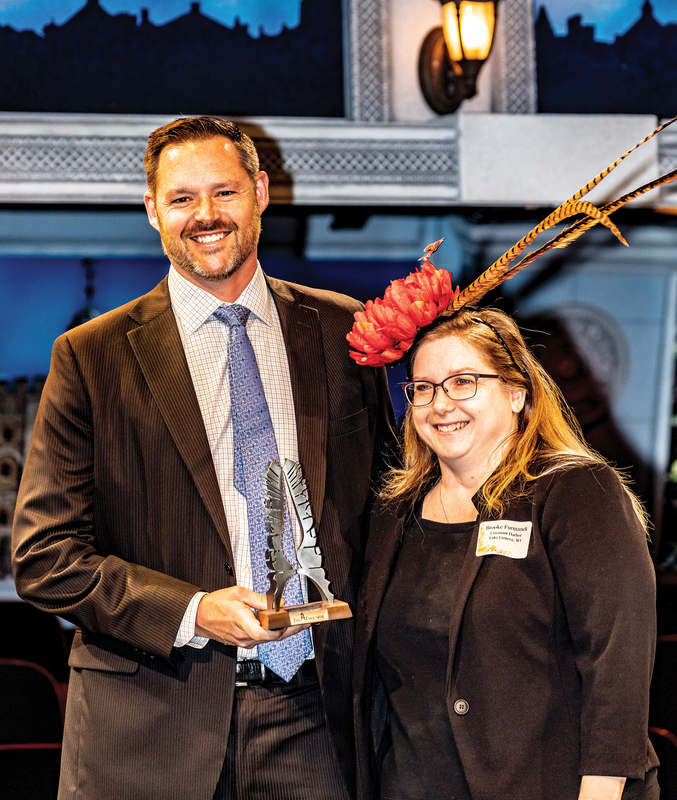 Saturday, April 6th marked the 26th Flame of Friendship Awards Celebration at The Fireside, recognizing the contribution of group leaders, tour companies, schools, and businesses that regularly bring groups of guests for a dinner theatre experience. This year’s invited guests included anyone who brought at least two groups of 40 or more to productions in the 2018 season. Guests were treated to a Steak and Lobster dinner, the performance of MY FAIR LADY, and gifts based on their level of participation from two shows up to all seven shows. The highlight of the ceremony was the presentation of two Flame of Friendship Awards. Since 1994, 87 other individuals have earned this award for their devotion to The Fireside and their own community, epitomizing the spirit of friendship. Tom Westlund, owner of Westund Bus Lines from Marinette, Wisconsin was the first recipient. Although planning to attend, he was unable to at the last minute due to having to drive motorcoach for a tour. Tom began his business in 1977 providing both school bus routes and motorcoach services to Marinette and surrounding communities. His commitment to customer service and longevity at the helm of this small business were instrumental in his selection. Tom will be awarded his sculpture at a later date. Brooke Furmanek, (pictured above with Fireside owner Ryan Klopcic) manager of the Road Scholar program based out of Covenent Harbor Bible Camp and Retreat Center in Lake Geneva was the other Flame of Friendship honoree. Brooke has been bringing groups to The Fireside for 20 years as part of the Road Scholar program where participants stay at Covenent Harbor for six days of classes and field trips. For example, before her group enjoys our summer production of ANNIE they will be educated on several aspects of American history during the 1930’s when the musical is set. Brooke’s passion for developing interesting programs is truly inspiring and we commend her commitment to combining education and entertainment.